While finally taking a night off – and trying to make sure her young cousin is okay working at Club Gouge – V.I. Warshawski inadvertently witnesses the aftermath of a fatal shooting. It seems inevitable that the death of the young woman, Nadia, is tied to the provocative show put on by The Body Artist, which makes the troubled Iraq War vet Charles Vishneski a prime suspect. V.I.’s main concern initially is making sure that her cousin remains safe, but she becomes drawn deeper into this mystery when she is hired by Vishneski’s parents to help prove his innocence. 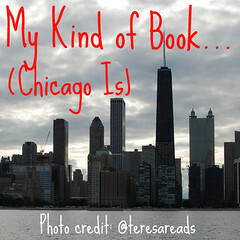 This is exactly why I decided to put on Chicago Author Month (aka, My Kind of Book). Somehow I had never heard of Sara Paretsky and V.I. Warshawski and as a Chicago-area book lover, this is an inexcusable oversight. I absolutely loved V.I., she has the same combination of grit and class as does Chicago itself. I also thought that the mystery in “Body Work” was intelligently crafted and resolved. There was a very smart political element to the story that I really appreciated. 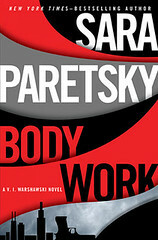 Perhaps my favorite thing about “Body Work” was the discovery that Paretsky has a huge backlist which can now be added to my wishlist. Highly recommended. Note: If you are interested in the fabulous audio edition of this title, I reviewed it for Audio File Magazine. Sara Paretsky has written some 16 novels, 4 collections of short stories, and a number of essays. I couldn’t agree more. V.I. captures the spirit of Chicago. I also enjoy how Paretsky took you all over Chicago in Body Work, from the lakefront to Pilsen to a gritty club in the warehouse district just west of the loop. Next on my list? Her previous book Hardball, set in the civil rights era in Chicago. Our Chicago Author Shelf would be incomplete without Paretsky. Oooh, Civil Rights era Chicago? Maybe we need to do a readalong! I’ve enjoyed the V.I. Warshawski books in the past, too – your review reminds me I should get back into the series. Excellent writing. I read alot of Paretsky back in the days where the only thing I read was mystery thriller series. I LOVE her characters. It was so much fun catching up with her in this book! The author and book are both new to me so thank you for this review. I have not read one of the V.I. Warshawski books in forever…I sort of miss her! I loved this book and really enjoyed how funny it was. Sara Paretsky is obviously very smart without taking herself too seriously. I think I laughed out loud while on an airplane when she was describing the bald-head’s eggish qualities.